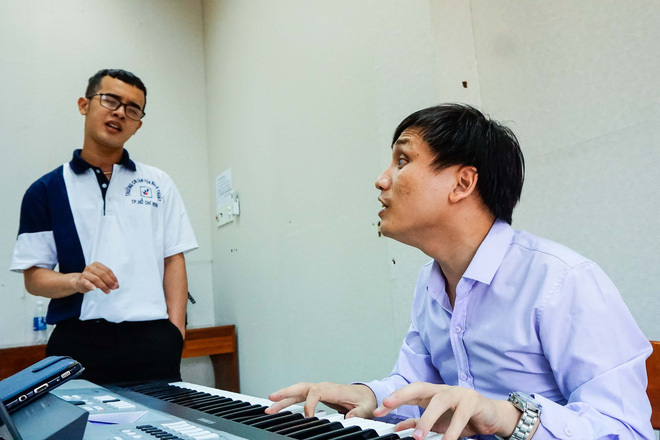 A Vietnamese graduate of the College of Arts and Culture of Ho Chi Minh City is now working as the first teaching assistant at the school, where his love and passion has been epidemic in the institution’s students and faculty. Vu Cong Hao doesn’t use any slides to support his lectures, nor does he write anything on the board. However, as the students attentively watch him as he sits behind a piano, it is obvious that projectors and lecture slides are unnecessary. Instead, with passion and gusto the young teacher imparts his knowledge on his students and they unwaveringly listen with all eyes glued on him. In order to stay at the top of his game, the blind teacher refuses to stop learning and spends his free time broadening his knowledge by ‘watching’ singing competitions on TV to hear how the judges evaluate each contestant’s ability and how each singing voice is mixed with different instruments and genres of music. Hence, not only does Hao become more knowledgeable by the day, he also stays updated on what his students are most interested in. In addition to taking interest in the contemporary music, the college instructor also reads about the history and background of world’s most famous pieces, as well as other topics his students might find relevant in order to make his lessons as intriguing as possible. All of this translates to practical, lively, and useful lectures which mesmerize students and keep their unwavering attention. 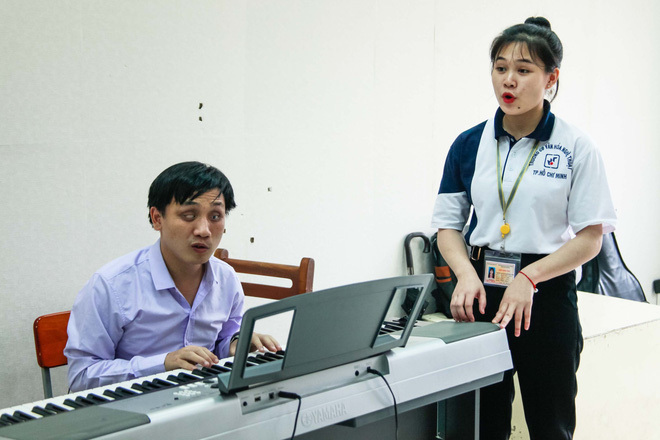 “In Hao’s class we learn both what we need for our academics as well as many other topics,” Le Thi Anh Nguyet, a freshman in the music education faculty, said. Nguyen underlined that Hao is different from most other teachers, who only provide academic knowledge and do not realize the students also want to have practical, broad, and good social understanding of the world. Hao also discusses the stigma he is subject to as a disabled person. “When a class starts studying with me, there are always a few who don’t believe I’m competent,” Hao admitted. 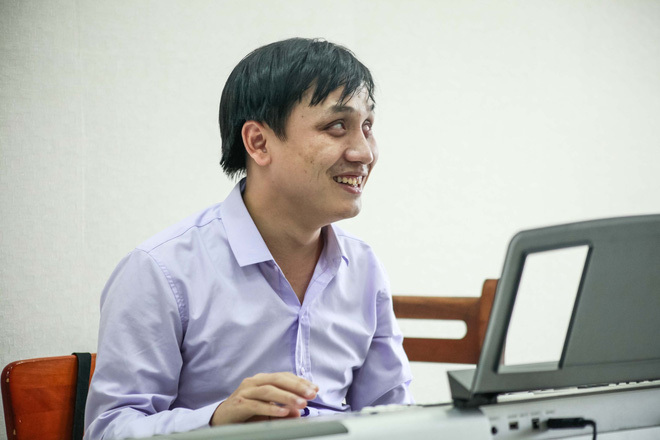 Though his impairment makes it impossible for him to write on music sheets or on the board, Hao has several technological applications that assist him in certain daily tasks. When it comes to evaluating his students’ performance, all he needs to do is listen to their singing teach them how to adjust their voice. Despite his visual disability, he has outstanding hearing which allows him to hear each individual instrument and closely analyze students’ voices. Hao sits still on his chair while his students take turns singing and he corrects the small details in their voices as well as each incorrect note of every single instrument. However, Hao’s teaching career also had certain challenges, particularly when students are unable to understand his methods. “Since the students don’t have much experience interacting with me, they do not understand [how it is to be blind],” he explained. Hao’s desire to change his students’ perception has manifested itself in his explanations of the different aspects of blind people’s lives, such as how he uses his smartphone, how he uses the internet and social media, and how he uses a computer to compose music. Not only does it help students understand him better, but it also contributes to the liveliness of his classes, making them more informative and fun. Moreover, as Vietnamese are not truly exposed to the blind population, what Hao does significantly helps students better understand this special community. Unlike most teachers, after the lectures, Hao does not stay in the teacher’s room. Rather, he spends time interacting with his students. He dines with his students, or stays in hallways to chat, which makes him seem more considerably more approachable to his pupils. One time a freshman even mistook him for a student. As he was walking, he ran into a student sitting in the hallway. He wholeheartedly apologized and asked which faculty the student studied in. “I am in school of tourism. Where do you want to go? I can take you,” the female student offered apparently mistaking the blind teacher for a student. Hao only laughed as he walked away. It was not until a friend of the student came up to explain that the blind ‘student’ she encountered was in fact a well-known and beloved teacher that the girl realized her mistake. Hao’s friendliness makes him adored by most of his students. Many even ask to take extra classes at his house, so the teacher is not only busy during the week, but also on weekends. “When people see that visually impaired people can practice different professions such as commerce, IT, or teaching, many say that we are ‘extraordinary’, but we are only regular people,” Hao said.